Many people believe that the Lake Erie Steelhead take part in an annual ritual lasting from fall through the spring as they return to the tributaries of the big Lake for the spawning season and while the steelhead season may last from fall to spring there are actually two completely separate runs. One in the fall and one in the spring. So when Team Surra Outdoors’ good friend and expert fisherman Marc Gergely told me about a new fishing line that he said would “speak for itself” I knew right away that the banks of Steelhead Alley would be the perfect testing grounds. The fishing line in question was Ultima lines. Ultima is a UK based company that has created a wide range of fishing lines to help fishermen land their targeted species. Do yourself a favor and check out their product listing here. 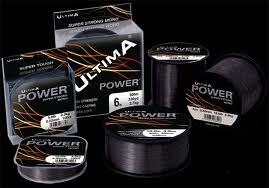 Marc handed me a spool of the Ultima Power Super Strong Mono 8lb sinking line. The box touted its high strength, ultra toughness, softness for casting, and sinking abilities. We paired it with the Ultima Purefly 6lb tippet; a fast sinking, pure fluorocarbon to float drift and bottom fish for monster Steelies. The line did in fact speak for itself as it was soft and easy to handle, extremely resistant to wear and tear, had excellent strength, and provided smooth casting over the course of three days. I was particularly impressed with the Ultima Purefly tippet. I was blown away by its strength and went the entire trip without having a fish break my line. This is some of the toughest and most durable fluorocarbon on the market today and it is completely invisible to the eye when hits the water. With weather conditions in the mid to upper 70s and clear skies above, most of the chromers were hiding around structure or nestled on the bottom of deeper fast waters. When fishing for steelhead around heavy structure it is imperative that you have a line that will give you the ability to muscle these beastly trout away from potential debris without snapping your line. This sets the table for a delicate balance between strength and visability because you must also fish a line that is not easily visable to the trout. I like to fish as light and clear as the weather conditions allow and I recommend fluorocarbon exclusively if you have any plans of enticing a bite from finicky low water steelhead. When float drifting for Steelhead you have to have excellent presentation. The Ultima Purefly fast sinking fluorocarbon tippet allowed Marc and I to fish with less lead weigh and provide a more natural presentation, which lead to more hook ups, and more fish landed. 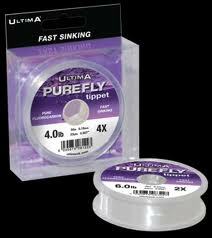 Needless to say I was thoroughly impressed with the Ultima series and will be using the remaining 6lb Purefly tippet as leader for all my 2012 trout fishing adventures. In total we landed between 20-25 Steelhead trout in a little over 2 days of fishing. Not bad for mid-upper 70’s, low water, and clear skies. The fish we caught were a mix of fresh chromers heading up stream and worn out steelies heading toward the lake on the backend of what had clearly been too much time upstream. 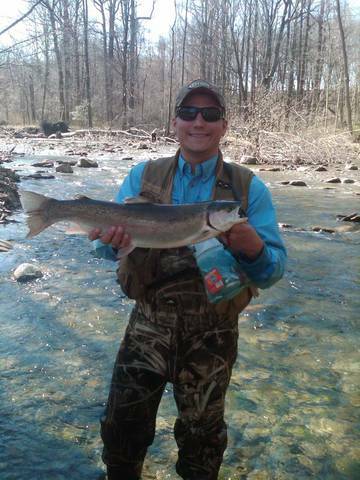 Andy Surra shows of this nice Steelhead caught on 20 mile run using the Ultima series of fishing lines. There is something special about Steelhead Alley. I’m not sure if it is the prospects of big fish or simply experiencing one of Pennsylvania’s most alluring and addicting outdoor activies with friends and family. 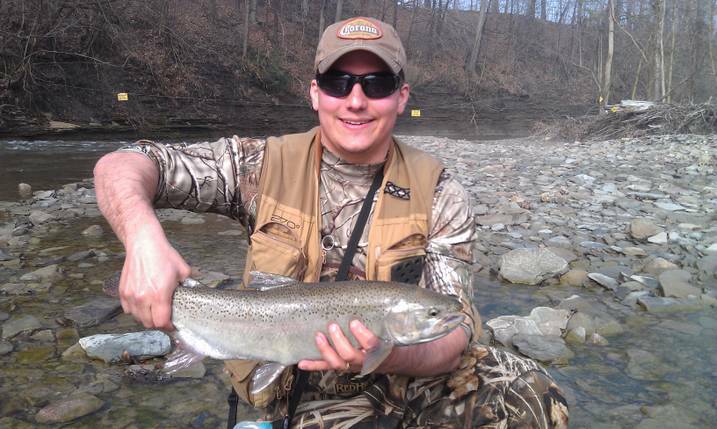 Maybe there really is something in the water that keeps us coming back to Erie to pursue monster Steelhead. Maybe it is moments like this when Mike Hanna nearly netted a leaping jack out of mid air just downstream from me. As always send us your questions at teamsurra@gmail.com. Be sure to “like” us on Facebook and follow us on Twitter @SurraOutdoors. I’ll leave you with this video that proves yet again that sometimes we are just unlucky. After all…it happens to the best of us.